The short-term scooter rental company is teaming up with a Chinese automotive startup to add more cars to its fleet. If you spend any time in San Francisco you'll see them. The red electric scooters with a white lighting bolt and the word "Scoot" plastered on the side of the cargo box. Scoot, the company behind these ubiquitous two-wheeled vehicles has been able to litter the city with over 700 of these bikes that can be picked up and dropped off via an app almost anywhere within the city. Now, the short-term rental company is eyeing cars. According to Scoot founder and CEO Michael Keating, the electric scooter rental service has been used by almost 50,000 users since it launched in 2012. An impressive number, but as pointed out by Keating, not everyone is comfortable braving the perilous streets of San Francisco on two wheels. 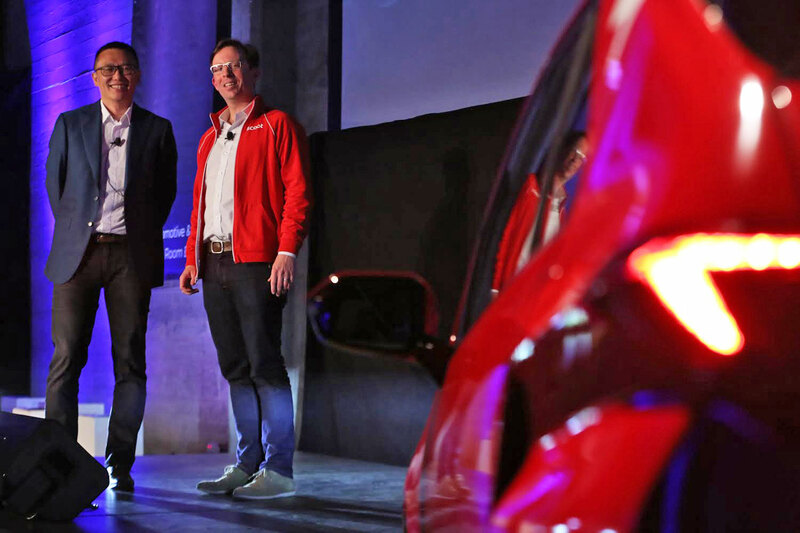 With that in mind, he announced a partnership with Chinese automotive startup CHJ to bring the automaker's yet-to-be-released small electric car with swappable batteries to San Francisco. The goal of the two companies is to recreate the scooter model with a small EV. 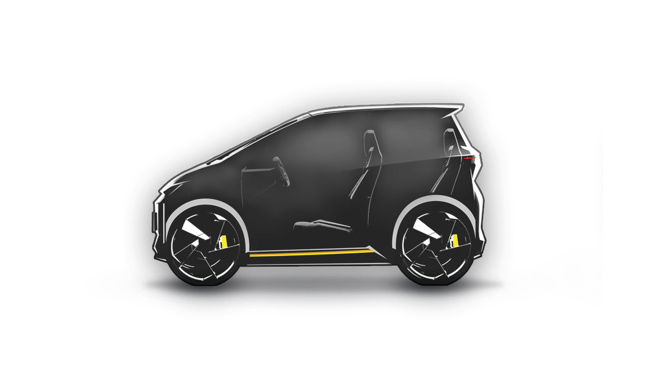 Riders would find and reserve one of these SEV (small electric vehicles) via the Scoot app, get inside and drive it to their destination, then just leave the car on the street for the next Scoot customer. That sounds great, but it's not allowed in San Francisco which is why the two companies invited the city council and policy makers to an event in the city's Dogpatch district. At the center of the shindig was the CHJ electric vehicle (which will be sold under the company name AmpGo) . A car roughly the length of a Mercedes Smart Fortwo but less than half the width. Small electric cars are nothing new, but the yet-to-be-named SEV has swappable batteries in the trunk that can be replaced in about a minute. That's what makes it suitable for a floating rental service. If the car never has to be plugged into a wall, maintenance crews can just drive around and swap out batteries, and the vehicle is good to go. "We want to bring affordable electric transportation to every San Francisco neighborhood without needing more charging stations," Keating said. The biggest obstacle isn't technology (the SEV is built to be part of a service like Scoot from its small size to it's Linux/Android-powered infotainment system that talks to the cloud), it's San Francisco regulations and lack of parking. In 2012, BMW launched DriveNow a service similar to Car2Go. The cars could be booked for one-way trips but the vehicles had to be parked in dedicated parking lots and the city just couldn't deliver those spaces. So in 2015, BMW left and later rebranded the service ReachNow and relaunched in Seattle. Scoot and CHJ are hoping that the small footprint of the SEV (four to five can be parked sideways in a typical parking space), its battery-swapping technology and Scoot's history of delivering a one-way rental service in San Francisco will sway city officials. But that may prove difficult as the area has experienced an increase in traffic with, according to research by the Northeastern University and San Francisco County Transportation Authority, services like Uber and Lyft account for up to 20 percent of the vehicles on city roads. Adding another car service to the already congested roads could be difficult. Keating notes this and hopes that adding Scoot's car-rental service to complement the transportation options already available in the city could convince some residents to give up their gas-powered cars for something that's more convenient and ultimately cleaner. The California DMV reports that there are over 413,000 privately owned cars in San Francisco according to 2016 registrations. Of those only 5,000 are electric. The CEO also noted that ride-hailing systems like Uber and Lyft need a complimentary low-cost alternative for when someone needs to get to a destination quicker than public transportation can take them. He said that the SEV would cost slightly more than the $3 per half-hour the company charges for the scooters on the network. Anyone that's used a ride-hailing services (which have rates that fluctuate wildly based on demand) knows that's a deal. So it's an uphill battle, but Keating seems determined that it'll happen. 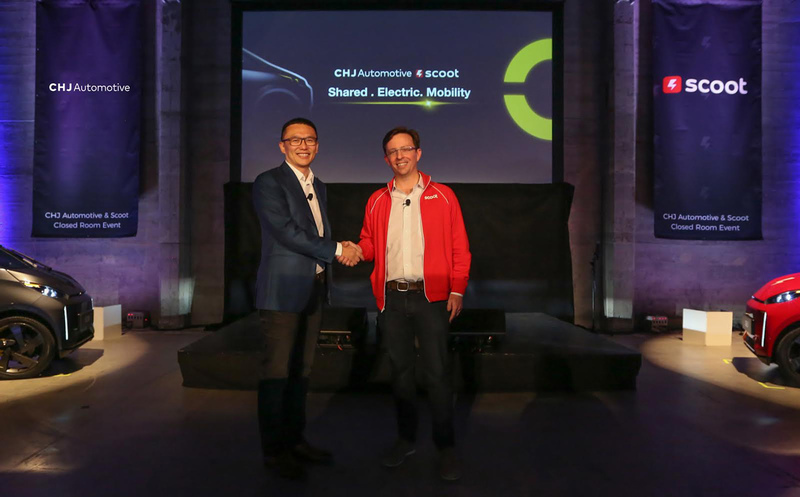 At the end of his presentation, he announced that Scoot and CHJ had come to an agreement to import as many of the small SEVs to San Francisco as the city would allow. That puts San Francisco on the spot to make a decision about how it works with companies like Scoot. It also puts a lot of pressure on a single tiny car. Unfortunately, Scoot and CHJ would not allow any photos of the vehicle. Yet, even though we only have a few out of focus glimpses of the vehicle in the photos provided by the companies, I was able to take it for a spin. Well, a circle, I was able to drive it around some cocktail tables in a room. It was far from a true test of the car's capabilities, but I was impressed that all the top-line features (touch-screen dash, transmission, rear-view camera, brakes, doors) seemed ready to hit the road. One feature that really impressed me was that the company had installed two buttons on one of the small rear flares that allowed the driver to get out of the car and back it up or move it forward with these controls. This is how the car can be arranged four (or five) across in a typical parking spot. At the end of the evening I was shown the power packs. Two 3.2kWh batteries that work in tandem to keep the car on the road up to 30 miles. It reminded me of Gogoro's electric scooter. A new way to charge without loitering around a station. Scoot and CHJ are hoping that these two boxes and the car they go in won't have them waiting around for the city as it tries to figure out if this unlikely partnership will help it reduce congestion while cutting emissions. Correction: an earlier version of this article cited the San Francisco Transit Authority as the agency that produced the ride-hailing report. It was the San Francisco County Transit Authority.